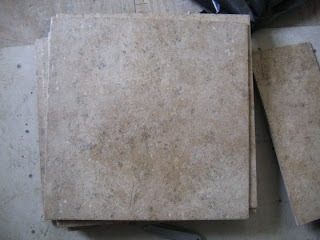 Someone gave me a couple of boxes of Daltile Passaggio Sorano Brown 18 x 18 tile. I figured, okay, I like it and I think it looks good with the cabinets I'm getting. No problem, right? Well, then next thing you know, everyone's lecturing me about dye lots. It's going to be a completely different color! Maybe it'll be off a shade or two, but it's not like a different dye lot of Sorano Brown is going to be purple, right? I'll just intermix the tiles. It's going to look stupid, you can't do that! This is stress I didn't need. Long story short, I drove down to the Daltile warehouse in Cranbury, NJ and brought one of my tiles with me. I held it up to the tile at the showroom, and guess what? It's the same exact freakin color! Turns out it was good that I waited to buy it because by the time I went to Home Depot (they don't sell tile at the warehouse/showroom...I don't get it either) they were having a 20% off discount on all special order Daltile. Anywhere I can save a few bucks in a good thing. UPDATE: 8/27 I've dropped all sorts of things on this tile...even a hammer! Knock on wood, nothing's scratched, stained, cracked or broken these tiles! Definitely don't use that pre-mixed mastic in a tub from Depot or Lowes. Get the latex modified thinset. Buy a cement mixer paddle...they're like less than ten dollars...and mix it yourself. Anyone that tells you it's hard to do is an idiot. I mixed it to a cake batter like consistency, buttered the backs of my 18x18 tile and laid them down. I tried out each tile w/o the thinset to see if I needed a tad more on one side or the other. Level, level, level. And make sure everything is as straight as straight can be. If I could do it, anyone can. Every contractor or construction person I know who's been in here can't believe I did it myself. No ones going to care about how straight or level your tiles are than you will, I say it's way better to do it yourself.